Whilst focusing primarily on the US stock markets during the past 2 to 3 months i.e. Dow Jones and S&P Index, the other western markets have been expected to follow the same or very similar trends which includes the UK's FTSE 100 Index. A recap of the anticipated trend has been for a rally into early October 2007, followed by a corrective decline into November and a strong rally into the new year to new highs for the year. The details of this analysis are contained within the archives. Accompanied by the scenario for the relative under performance of the asian markets as of late October and into the new year, which continues to be borne out by actual price action. Now having had Up move A into early October, and the Corrective Down move B, the expectation has been for a strong end of year rally to New highs, this was pretty much on track until this weeks plethora of news around interest rates and concerted central bank intervention that knocked the western stock markets off track. Therefore this analysis is an up date on current expectations for the FTSE 100 Index (which is applicable to other western main general sector indices) to see if the scenario of an the end of year rally continuing remains intact. I will try not to look further out as I will be preparing long-term outlooks for numerous markets for 2008 during the next two weeks. The FTSE bottomed at 6027 on 22nd November, which was above the important support zone of between 5950 and 6020, which implied that the next upswing with be impulse in nature and thus target a new high for the bull market inline with the end of year rally scenario. The 6027 low was followed by a powerful up move through 50% resistance of the decline from 6751, this was in confirmation of the bullish trend into the end of the year which was the focus of the existing scenario. Last week we saw the up trend correct lower, on Friday the correction held above the 50% of the advance at 6320, a sign that at this time confirms the minor downswing as corrective in nature. Time wise the upswing is barely up 3 weeks, whereas impulse upswings usually extend into at least two months, this supports the view that the current upswing has further time to the upside. The MACD has risen from an oversold state and is nowhere near achieving an overbought state again confirming further upside action. As far as i am concerned and as per the above analysis, the FTSE has not done anything so far to suggest that it is at the end to the now approaching 5 year bull market. Without getting sucked into a longer term analysis at this point, all I will say is that yes the broader pattern suggests a tougher period ahead for the FTSE, but the up trend remains intact. To be frank, I don't go looking for ends to bull markets in stocks for if I did I would NEVER! be invested!. At best an investor can hope for is to take account of warning signs to reduce exposure to sectors which do look like are going to take a hit as happened with the financial's sector earlier on the year. So I am sticking with the scenario of a strong rally into the end of the year, and to refine that further to say that the rally is likely to extend someway into January 2008, as the up trend inline with recent price action will be volatile. 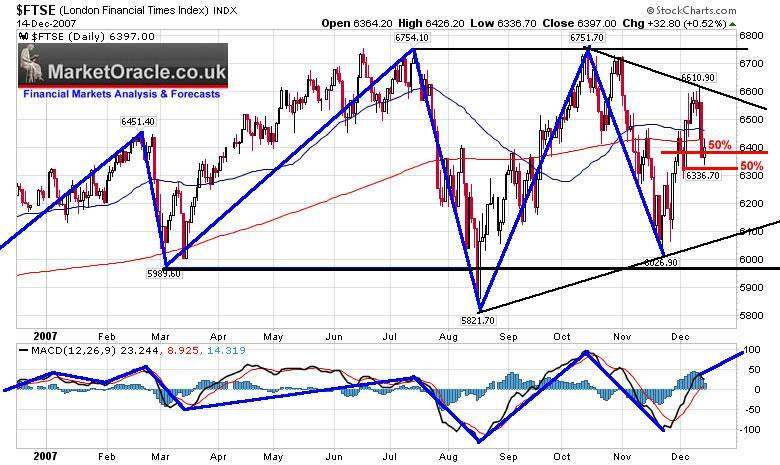 As to will FTSE break above 6750 by year end, about 9 trading days ? That does look unlikely with the FTSE at 6397. Fridays big drop in the Dow of some 180 points will hit the FTSE on Monday so Monday will be a strong down day. Therefore we can scratch Monday from the 9 days. Tuesday another possible weak day which would just leave 7 days to achieve a rally of possibly 450 points or more! That's not going to happen !. Therefore more likely a move to between 6600 and 6650 by year end is likely. Also, watch out for a string of forecast / scenarios for 2008 on a range of markets in the lead up to the new year as well as comparison against what happened to last years forecasts viewable at my archive. Expectations are for the FTSE 100 Index to resume its up trend during the coming week, the start of the week will be weak!, how weak its difficult to say perhaps see the FTSE trade down to 6320 or off a about 80 points from Friday. The rally is expected to extend well into January 2008 from the November 6027 low. My best guess for where the FTSE will close on 31st December 2007 is at 6640. Also I enjoy your emails and comments, does not matter if you strongly disagree with me :) so feel free to write / post your comments to this article.